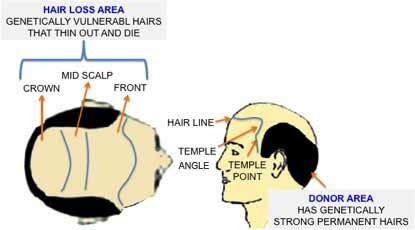 The most common condition leading loss is called hair “Pattern Hair Loss or Alopecia Androgenetica”. This affects only front & top “U” shaped central area of scalp. Genetically your hair in this area is Hormones sensitive. These hairs become thin in diameter and cannot grow long and eventually the hormone ( 5 DHT) kills this hair in a particular pattern (Shape). The hair on the back and the side are genetically strong hair and live permanently as you might have observed by now. We use the roots (Follicles/ follicular units) of this permanent hair and graft them in the area where you have lost your hair is called the Follicular Hair Transplant. Hair Transplant does not increase the total number of your hairs in the scalp because here we redistribute the hair from the back in such a way that you grow sufficient hairs on the hair loss area to look good without the Donor area looking bad. The Follicular Hair Transplant that can help you change your look. It grows natural looking, permanently growing maintenance free hair that grow long and does not grow thin under the effect of Hormones. You can cut, colour and style the hair that does not require special care. You can even shave off your head but these hairs grow back like your hairs in the back of the head. Hair Transplant is usually a one day procedure and it is done under Local Anaesthesia (only skin is numbed) while you are conscious and communicating through out the procedure. Not only that there is no hassle of Hospitalization or bandages etc. It is done as an outdoor procedure, in very comfortable setting.